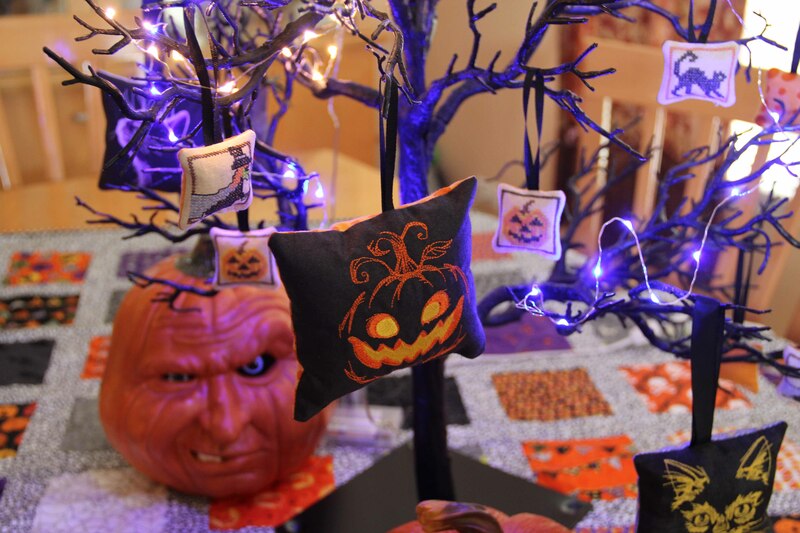 Doesn’t everyone have a Halloween tree? It’s a silly thing, I know. But we get a kick out of it. 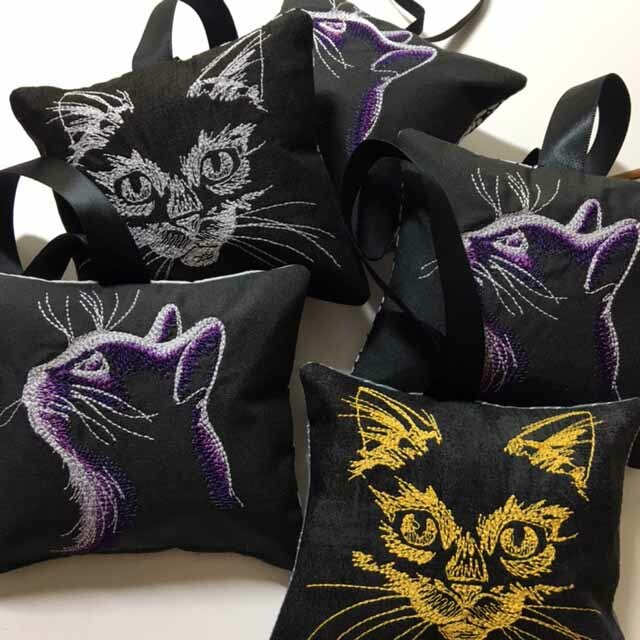 I make all the ornaments in machine embroidery as in-the-hoop projects. 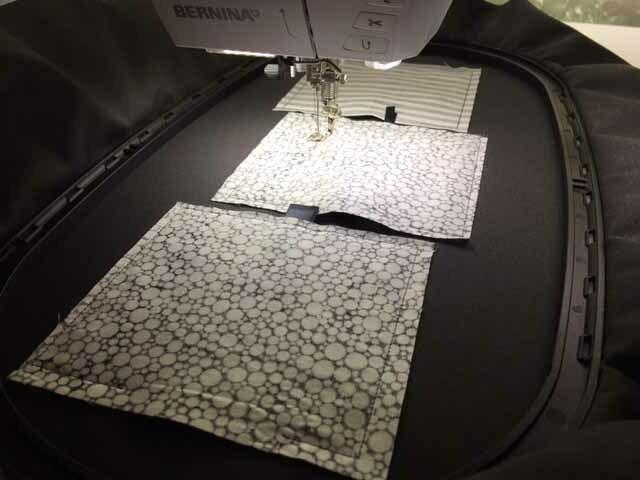 First, the actual embroidery design is stitched out. A placement line is stitched, so I can see where the backing will be placed. Before the backing, I tape down a ribbon for hanging. Then the backing is laid down with right sides together. The backing then gets stitched down with an opening at the bottom which allows for turning the item inside out. Once the backing is stitched down, I can take the whole thing out of the hoop and trim 1/4 inch around the outside, clipping the corners, and turn it inside out. Just add a bit of stuffing, stitch up the bottom and you’re done! Three at a time at this size. When I make them even smaller, six at a time is just as easy! Finished and ready to hang on the tree. I hope this gives you some ideas for the holidays. Happy stitching! It’s a chicken soup kind of day. My son came home after his first few days of high school with a nasty cold. I’m not surprised. The place is a breeding ground for experimental teenage germs. On top of that, the weather turned cooler today…for how long, I’ve no idea. But it’s cloudy and cool right now. Furthermore, like everyone else in the sewing industry, I read Nancy Zieman’s latest blog with a heavy heart. Whether you watched her show or not, you know Nancy. You buy her notions or you attend Quilt Expo in Madison. I’ve learned many tips from Nancy along the way, but my favorite line was this: ” I sew at least one quilt a year for charity.” She never said “You should…” She told us what she did, and then she did it, among all the other wonderful charitable contributions she made within the industry (and outside of it). So, yes, it’s a chicken soup kind of day. While the soup bubbled away, I sat down with my laptop and organized some of the Halloween designs I want to make in the very near future. 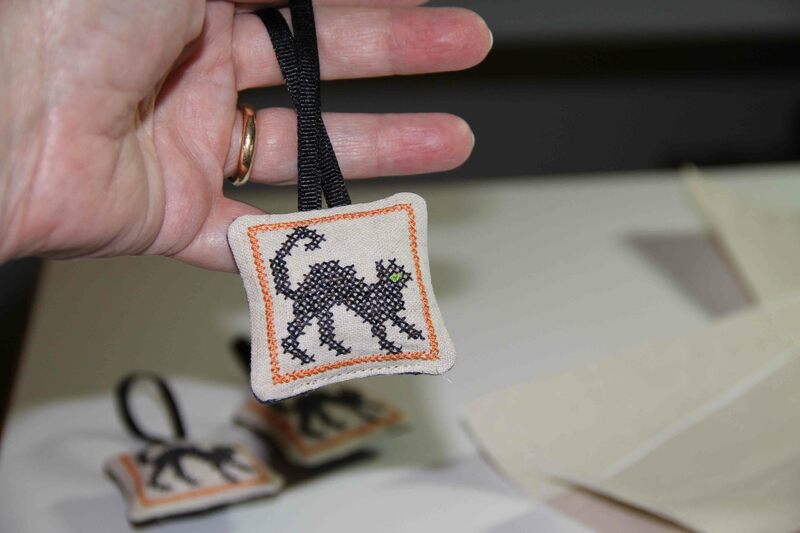 I use Bernina Embroidery Software 8, and I’m planning on making tiny pillow-like ornaments to hang on my Halloween tree. The designs I’m using came from urbanthreads.com, a favorite of mine for cute and/or spooky embroidery. It’s hard to see the design in this shot but it is a single thread color of a cat. I used a feature that people rarely take advantage of in the ‘design” menu. Click on “background” and change the background color in the hoop. Now you can actually see what the design will look like stitched out on dark grey or black fabric. In the prior shot, you can see where I added stitching in a square around the outside. Before I stitch that, I will add a square of fabric and a ribbon for hanging. I’m not stitching out today, but I promise to share when I do. 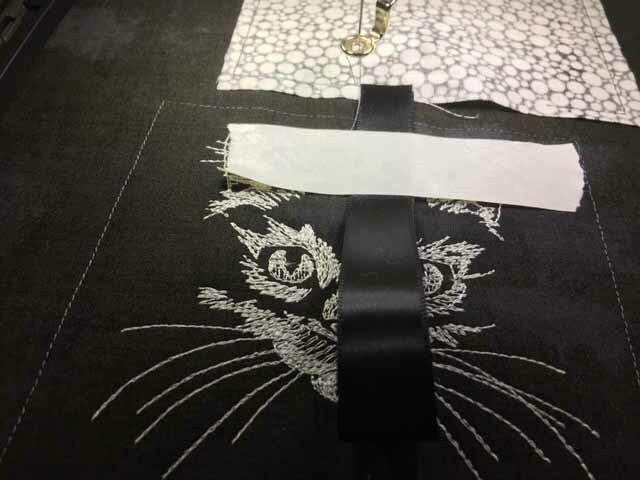 In this design, I’m stitching the profile of this cat, but it has multiple thread changes for each cat. For some reason, the.exp file I’m using has changed all the colors from shades of purple to random colors. 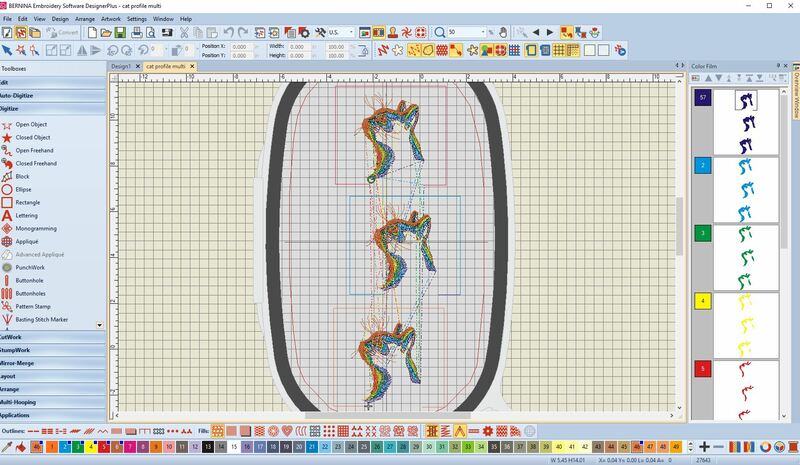 I did not take the time to fix the thread colors on screen because I will just use the correct ones as I stitch out. The important thing to note here is that on the side, in the color film, I used the “Sequence by Color” tool. This way, I’m able to stitch all the same colors at once instead of changing threads each time for each color on each cat. Whew! It makes a big difference in the amount of time it takes to stitch out. 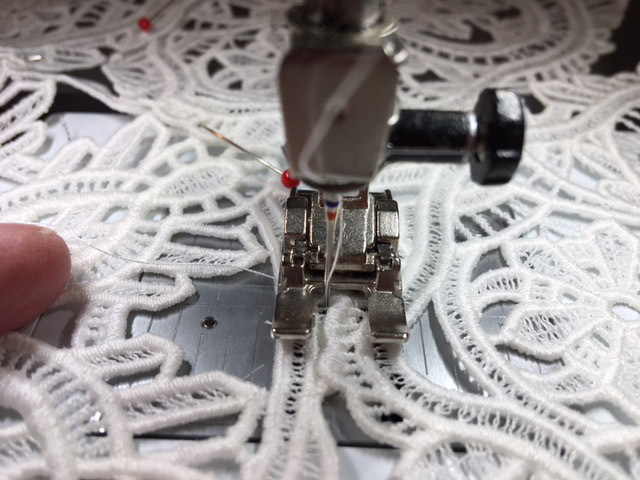 Also, I will have to cut the jump stitches in between each thread change, as I have the thread moving around quite a bit. 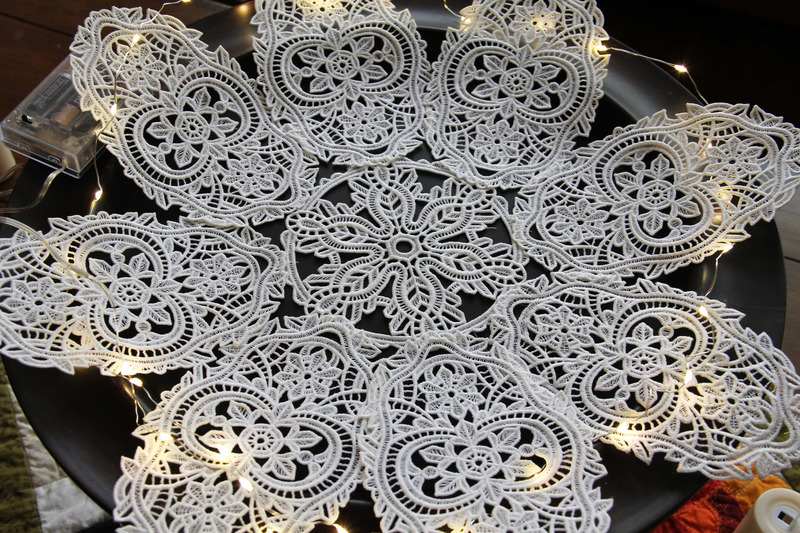 Still, I have loaded all this onto my USB stick and am ready to stitch as soon as I prep some fabric, stabilizer and fabric for the backs of these cute little ornaments. Can’t wait to get started, but I won’t have time for a couple of days. 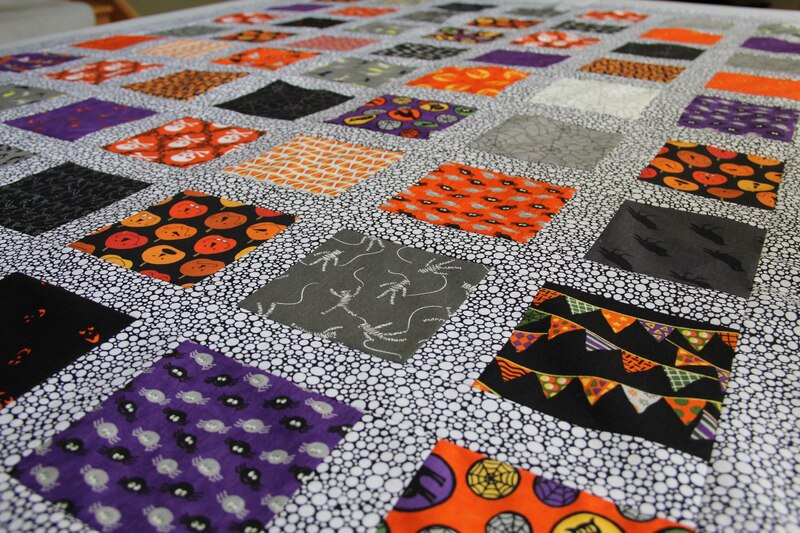 My Halloween quilt is complete, and ready for its debut! Stay tuned. 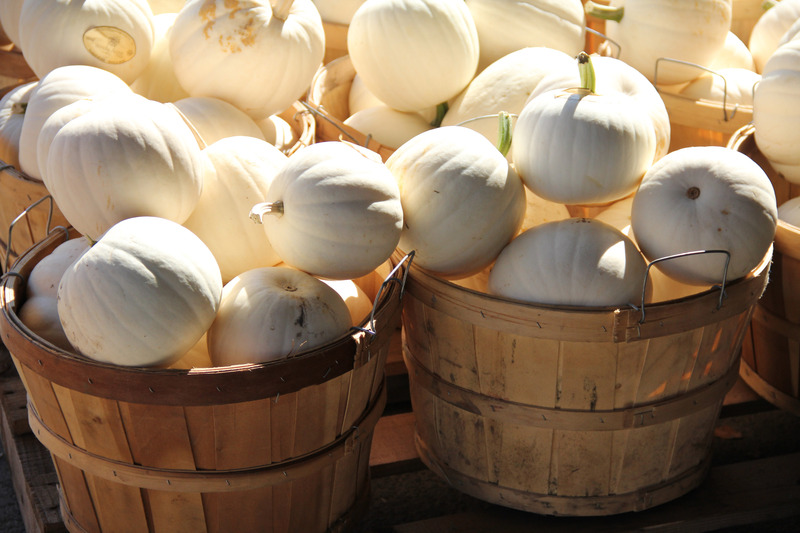 It may be early September, but it’s already time for a cool change. And it happened this week. Never mind that it’s the middle of August. Never mind that the tomatoes are just starting to come in. When you work in marketing/advertising/retail you get the urge to plan for that next holiday. 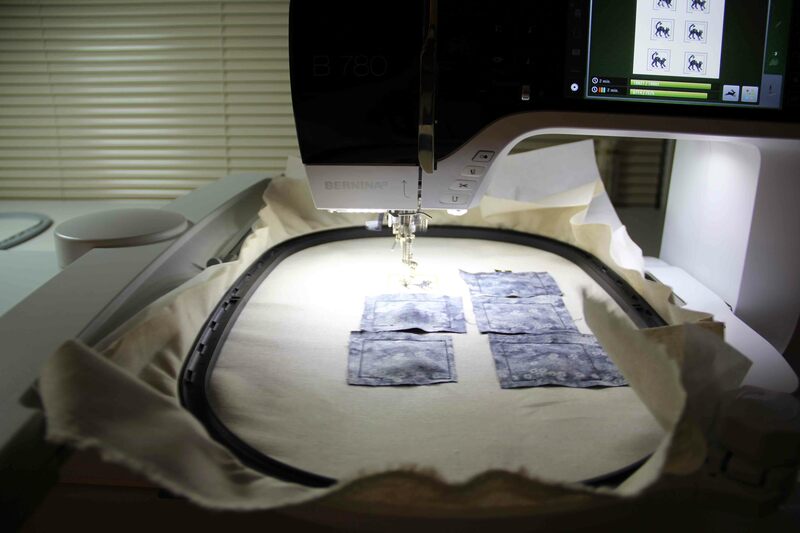 It’s the same way in quilting. 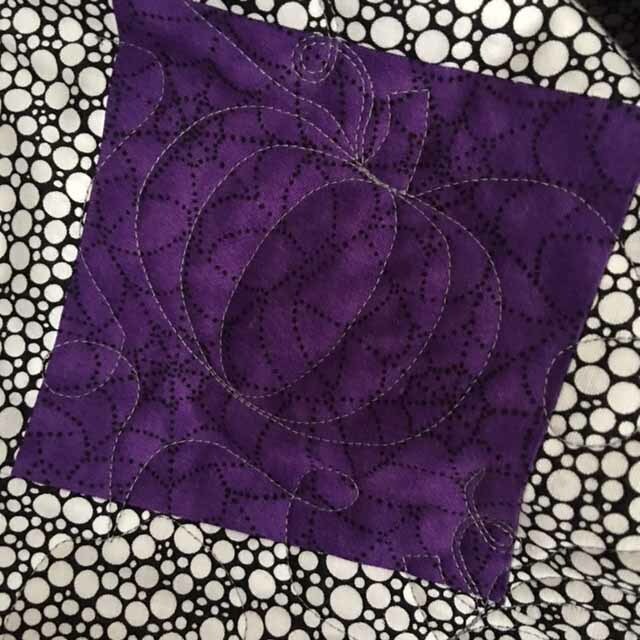 Nevertheless, as soon as the temp dropped for a day, I turned to some Halloween fabric I’d been holding for a few years and thought, “Now’s the time!” This is not a complicated quilt. But it’s made from a charm pack purchased several years ago and tucked into a drawer. Don’t pretend you don’t know what I mean. This is all fun stuff. 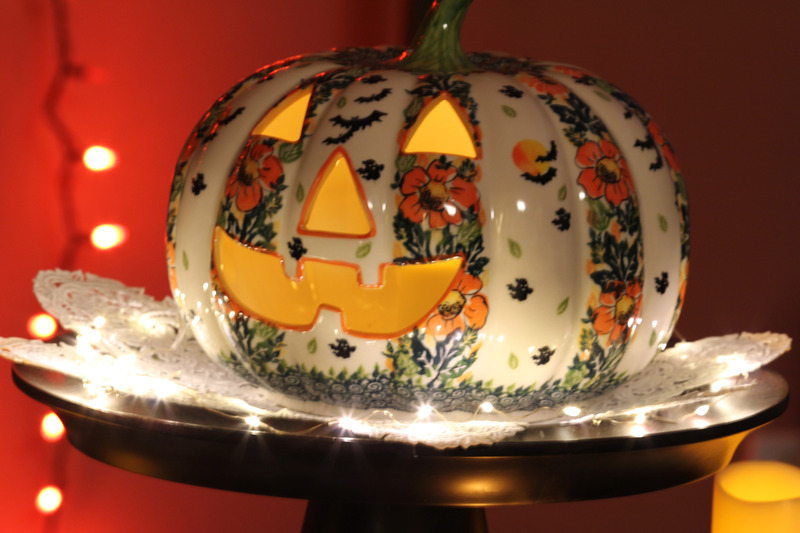 It’s bright, it’s cheery and it still has that Halloween vibe. The charm pack was from a line by Deb Strain for Moda. I supplemented with a couple of other random fabrics from Cotton and Steel, Andover and Wyndham. I cannot quilt it yet, even though it’s layed out and pinned. 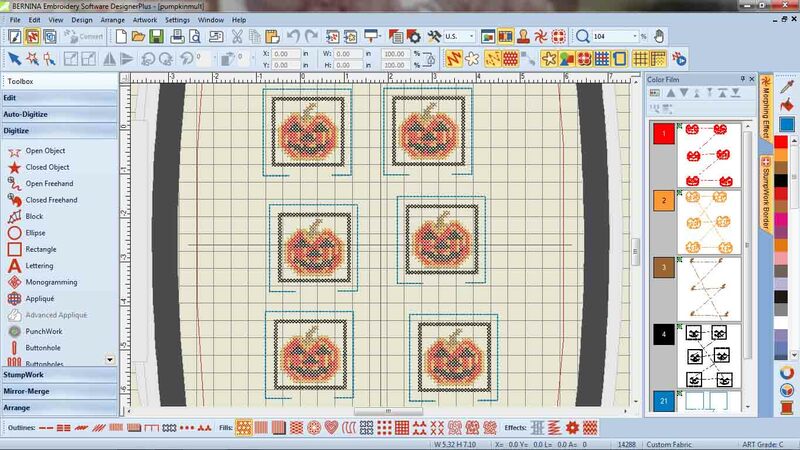 I thought I had a Halloween design from Amelie Scott that I could use to quilt in machine embroidery. Turns out I only had some vines and leaves. 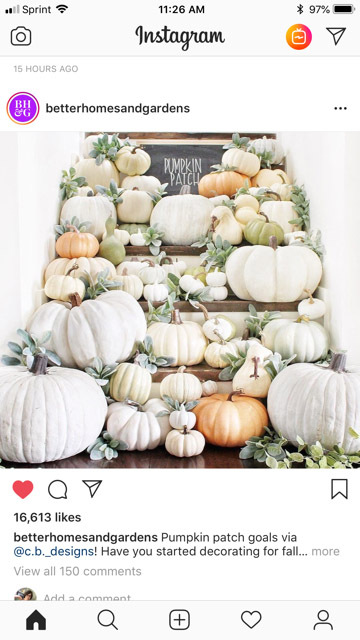 This quilt absolutely requires pumpkins for quilting. 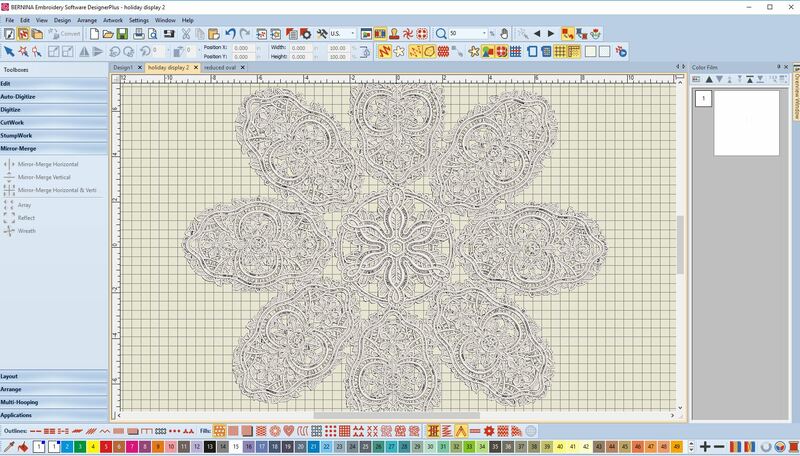 So I purchased another design pack, and I will start quilting as soon as it arrives. 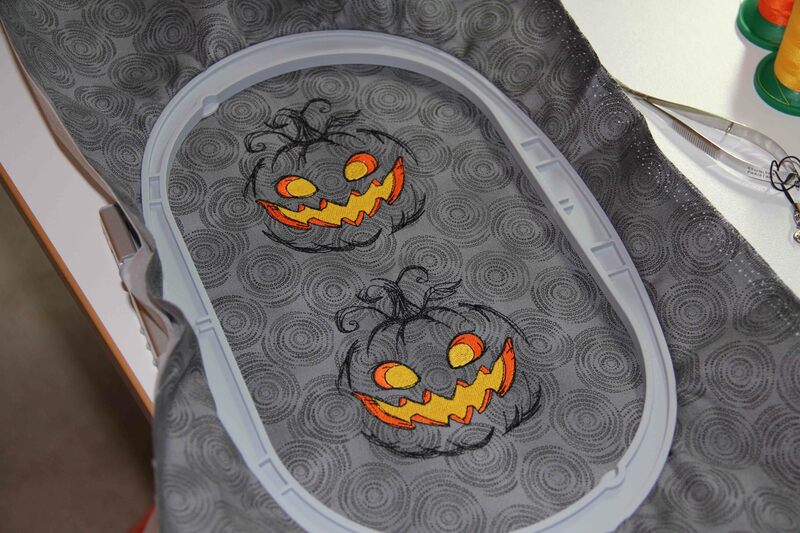 Until then, I found some terrific Halloween ideas from urbanthreads.com that I can’t wait to try. 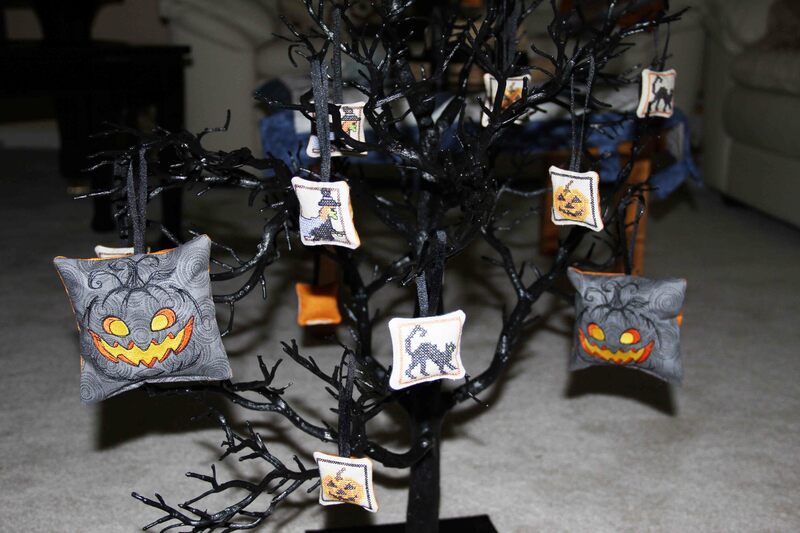 I know you don’t remember from last year, but I have a Halloween tree that I fill with embroidered ornaments. Every year, I look for something I can make to add to the collection. Well, I found a few new things. But you’ll have to wait a bit until I have the chance to work on them. Temps are in the seventies here today, with clear skies. 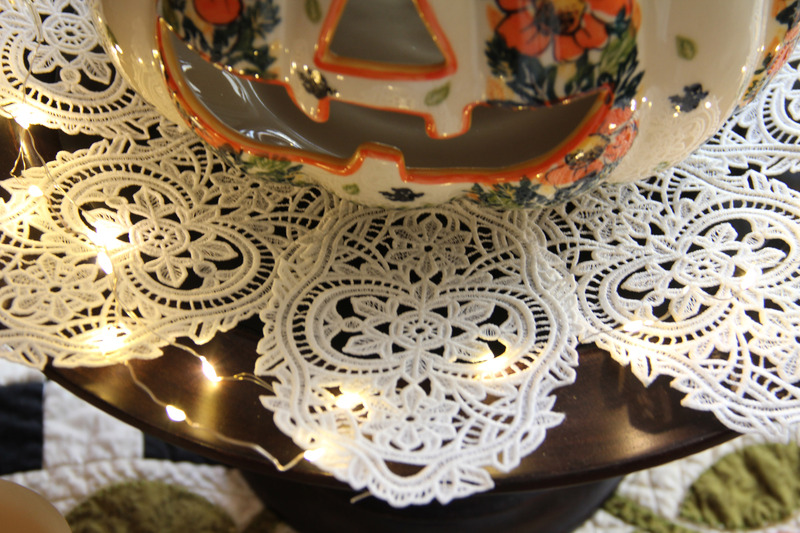 But in my sewing room, there’s a cool spooky breeze a-blowin’. I have always enjoyed Halloween more than Christmas, or whatever mid-winter holiday you celebrate. Too much pressure, too many gifts, too much hype. And when you work in retail, Halloween isn’t much better. Most chain stores start putting their Halloween decorations out July 5. But when that first crisp fall breeze rolls in, and those first few leaves begin to fall, I get inspired. Many people do. Once the kids are all back in school and the “official” fall season starts, it’s amazing how many of us turn to our craft, our hobby or our passion once again. 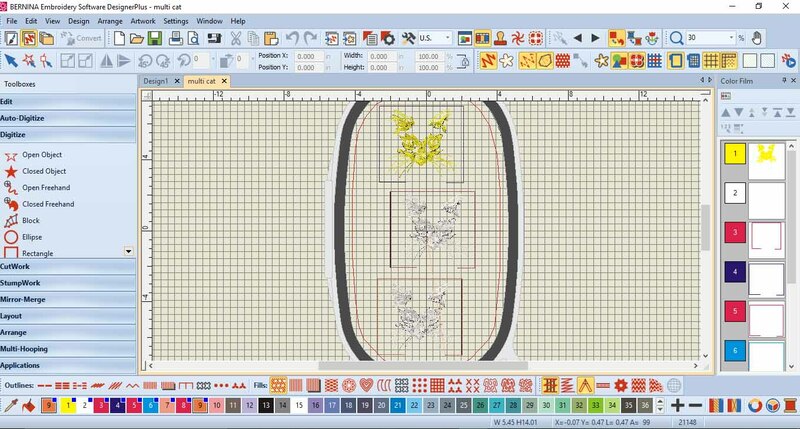 So this year I am teaching some students to use the cross stitch program in Bernina Embroidery Software 7. I am not a big fan of cross stitch..at least not actually DOING it. However, I love the way it looks, and I love how easy it is to get some things done in software (which I DO love to use). I stumbled across some lovely cross stitch designs in Just Cross Stitch Magazine. They always include many many patterns for people to use. 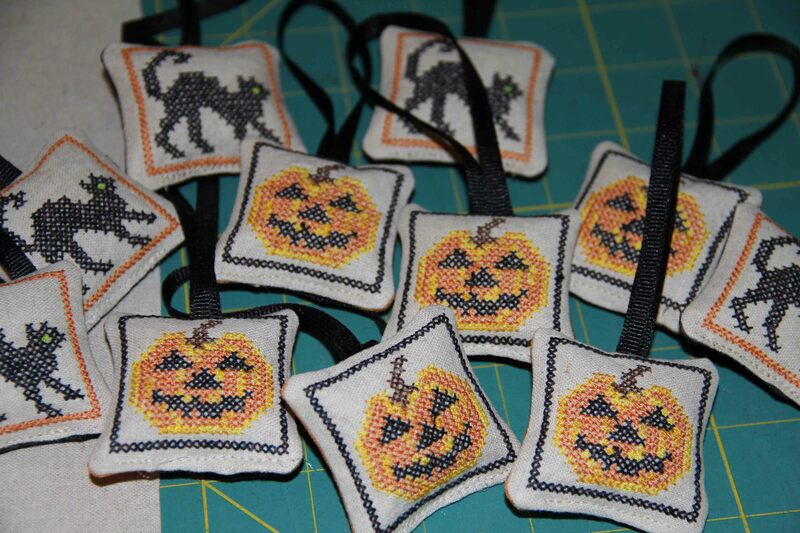 I scanned a few of their Halloween “ornaments”, and brought the jpegs into the cross stitch software. 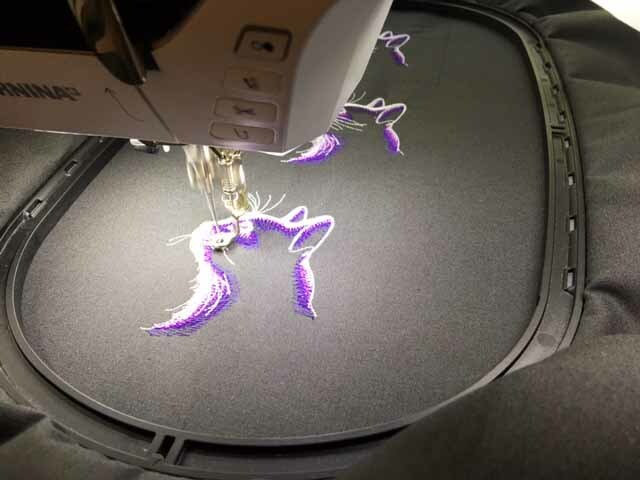 Then you can use the software to create stitches following the image in the background. I wanted to keep these very simple so I could make many, but not take a lot of time. 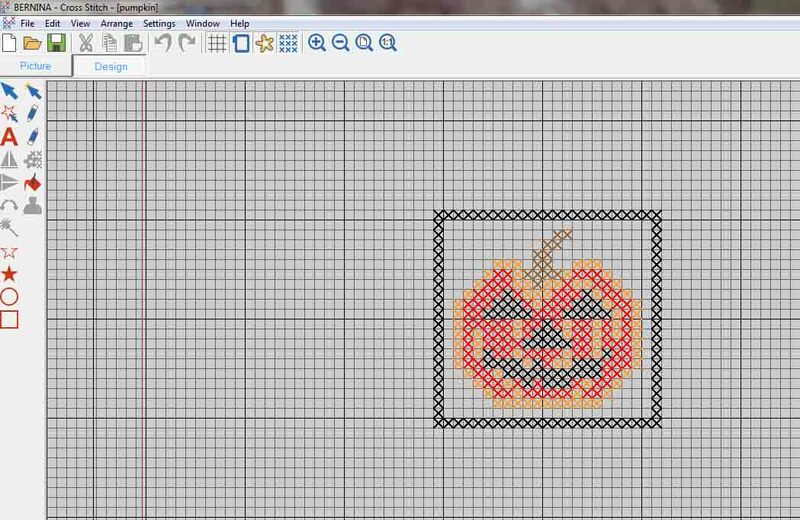 The cross stitch program within Software 7 saves the file as .arx extension. 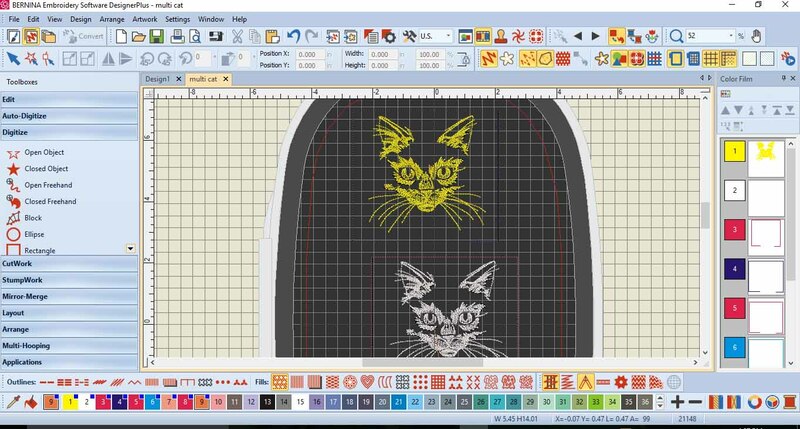 The next step of course, is to bring the cross stitch design into the actual embroidery software. 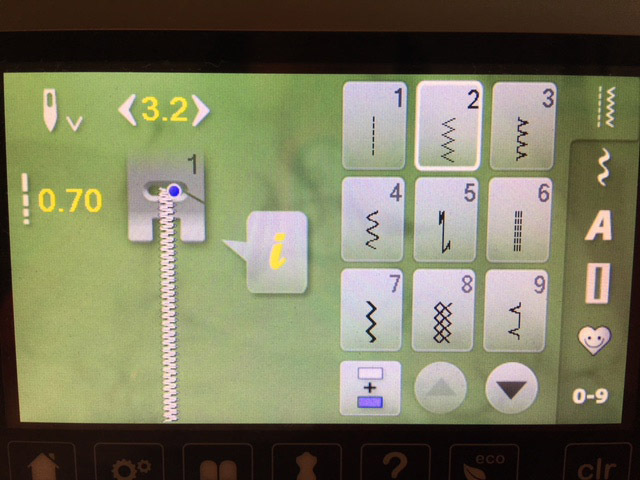 I love this technique because it turns all those little x’s in the Cross Stitch program into machine-readable stitches. And then it’s just an embroidery design. 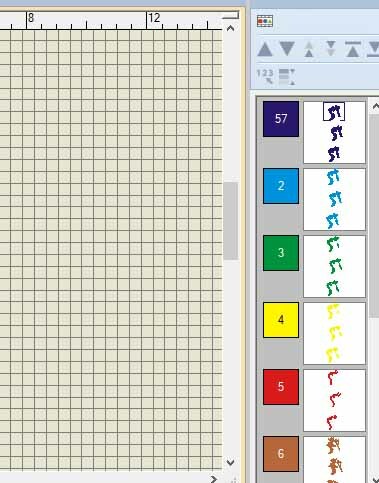 Once one file is in the software, you can repeat it multiple times. I also rearranged the color film, along the right, to stitch all of one color at once instead of all the colors in one pumpkin at a time. This is a huge step and really cuts down on thread changes. At the end, I added a double run stitch around the outside of the ornament, leaving the bottom open, so the little critters could be turned inside out and stuffed. Before that last double run thread stitches, I added the backing, with right sides together. Under the backing I taped down some ribbon, so that they could be hung. As you can see, in the hoop, they look like little ravioli. 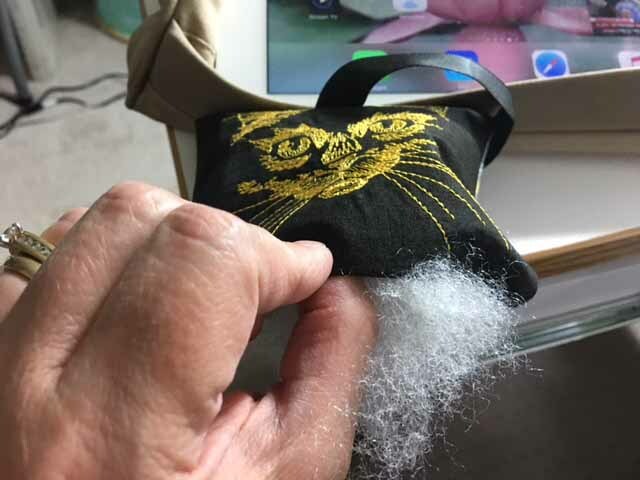 When all is done stitching, I cut everything out, clipped corners, turned it inside out, stuffed them with polyfill, and used the machine to stitch along the bottom closure. Voila! Six or eight of them will fit into the jumbo hoop. I managed to create a cat, a witch and a pumpkin. I also made some larger ornaments with regular embroidery on them. 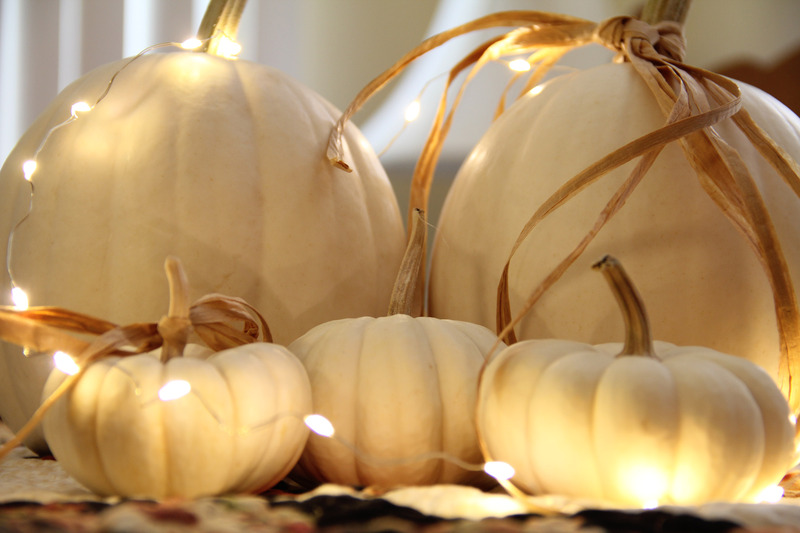 I bought a cheap Halloween tree for the house and one for the shop…these will be on display for awhile! And if I have time, I’ll make more…it’s a little addictive. And really pretty fast and easy when you make use of technology! Gotta love it.